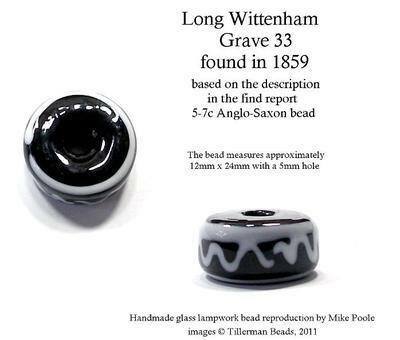 The Long Wittenham finds from 1859 included this lovely black and white bead, measuring approximately 16 x 24mm, with a 5mm hole. Although there is little information about the grave, it was found with other beads and grave goods indicating that it was most likely a female grave. No exact dating information is available but it is believed to be 5th century.